Abracadabra Pon was a magic phrase used by Sailor Pluto and Small Lady/Chibiusa in the manga, Crystal, and musicals. Sailor Pluto taught the phrase to Chibiusa in the 30th century, when Chibiusa secretly came to visit her while she was guarding the Space-Time Door. In the manga, Sailor Pluto told Chibiusa to say the magic phrase "Abracadabra" whenever she was sad, and it would enable her to perform magic. Chibiusa used the phrase to conjure various objects using Luna P. When Sailor Pluto used it, she pointed her Garnet Rod at Luna P, making flowers appear out of it. 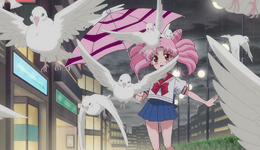 In the musicals, Chibiusa learned the phrase in Tanjou! Ankoku no Princess Black Lady and its revision. As she said it immediately before the Black Moon Clan attacked Crystal Tokyo, she thought the destruction of the city was her fault. This page was last edited on 9 October 2017, at 14:12.